If you're searching for West Windsor NJ Photographers, chances are you will probably come across my website. Many of my photography projects are in the West Windsor NJ area, including this image. This photo was taken right outside the MGCP mosque in West Windsor. I'm always thrilled when the couple is brave enough to do something like this. It wasn't easy walking through this field because of the dense vegetation. 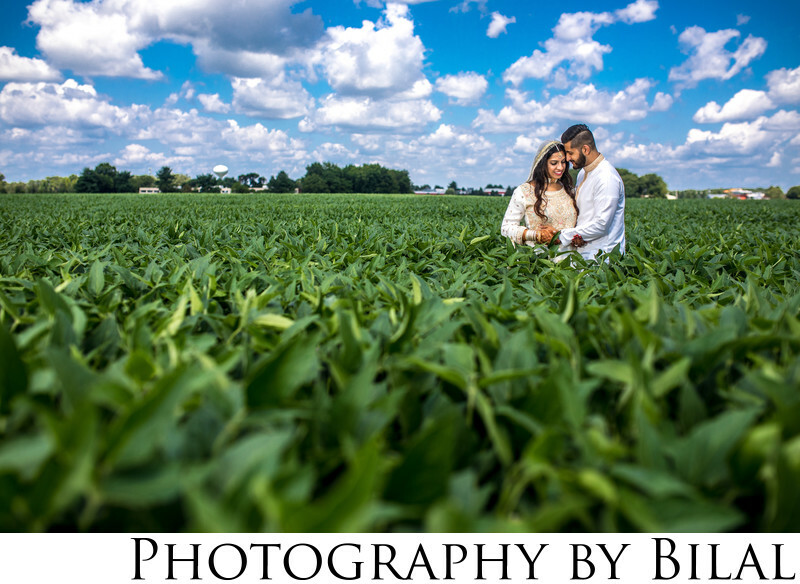 But the couple managed to walk at least 50 feet into the field and I was able to capture this amazing image. The contrast with the blue sky and green field just made it look phenomenal. Since it was a bright sunny day, I had to use extra lighting to get rid of shadows caused by the harsh sunlight. I used two off camera lights, (Godox AD200's), to light the couple. Luckily, one of the bride's friends was able to hold the lights, since my assistant wasn't able to make it this day. She did an amazing job! After capturing this image I shot a few more photos at the exact same location with other couples. This location has become my signature location anytime a couple has their nikkah at this mosque. I love being able to capture dramatic images such as this one. Location: 2030 Old Trenton Rd, West Windsor Township, NJ 08550. Keywords: best nj wedding photographer (6), bride and groom in a field (3), central NJ wedding photographer (3), muslim wedding photographer (3), pakistani wedding photographer (6), photography by bilal (24), umar and reeda nikkah (3), west windsor nj photographers (3).